This is a recording of a musical get-together by Roy Harper fans on June 9th 2001 – the night before Roy was playing his 60th Birthday concert at the Royal Festival Hall. Myself and Gareth Davies performed as ‘Hot Snax’ (Gareth’s successful attempt at the worst band name ever*), and we did the following little set, which is featured on the CD along with performances from Pavlov’s Cat, Paul Davison, Andy Roberts, Jon James, Joe Penczak, Graeme Dutton, Ben Raudnitz and Jont. 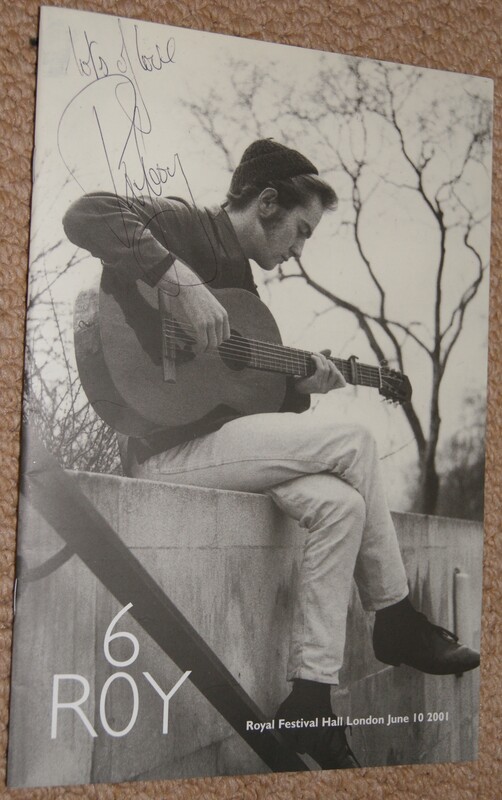 I briefly met Roy Harper the day after, and asked him to (a) autograph my concert booklet, and (b) choose a title from Gareth’s Album Titles book. Roy put a small ‘x’ next to the title ‘From Spod To Bod’. * He’s since come up with BrutForce, which is worse still.